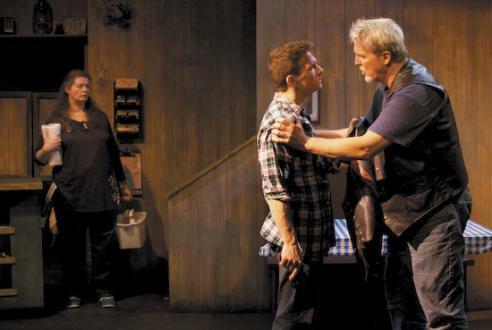 Mortar Theatre’s mission is to “engage community dialogue by lifting up and exploring stories of everyday heroes who shape our society.” The truckers of this world are certainly a group of everyday people whom we don’t necessarily categorize as heroes. But have you seen Ice Road Truckers? Those guys are badass! Jayme McGhan’s taut new play, Mother Bear, takes us deep into dry, dusty and desolate nowheresville, Utah (actually, Green River, Utah, but I just did a Google Earth view, and, well, it’s very brown) where pancakes fill the plates and truckers rule the land. A tough dude named Mother Bear (Jim Farrell, clearly having a ball exploring the incongruous facets of this antihero) leads a pack of fiercely devoted trucker thugs, called the Disciples, who hijack trucks coming in from Mexico and sell the drugs and weapons they contain. Not unlike a road-raged Robin Hood. Enter Freely (Brian Plocharczyk), a smug young lawyer who crashes Mother Bear’s hangout, the Coyote Pass Truck Stop, and attempts to convince (read: blackmail) Mother Bear to join his startup union, knowing if he gets this opinion leader on his side, his thug followers will join right along. But Mother Bear isn’t having it. Meanwhile, a spitfire trucker named Delia (Maria Enriquez, making a strong impression) wants inside the Disciples, but Mother Bear is leery. Is it because she’s a woman, or because of something more? I really liked this play — I’m glad I caught it before its run ends this weekend on June 19. It’s filled with interesting characters, tight ensemble acting, and a story you’re immediately sucked into. McGhan’s lean script, combined with Jason Boat’s straightforward direction, makes this pedal-to-the-metal play a tense and twisting ride. The last 20 minutes are killer. There are some issues. Because the action takes place in a small town truck stop (designed with exquisite detail — I loved the hula girl dashboard dolls on the stock shelves! — by Edward Matthew Walter), the logic of the script takes a back seat at times. For example, I don’t think the best place for Delia and Freely to have a top-secret discussion would be in the truck stop around suspicious ears. And a fight scene, though well-choreographed by Elizabeth Styles, grows frustrating when you learn one of the participants has a loaded gun on them the entire time, but chooses to use it at the absolute worst time. At any rate, I’d recommend catching this (mother) bear of a play before it trucks on outta here June 19 (yay mixed metaphors! What do you want from me? It’s Friday).